Mine is the story of The Little Mermaid and my favorite movie adaptation was the one released by Walt Disney Pictures on 1989. This is a story of a young mermaid who was willing to sacrifice her tail to win the love of a human prince. In a recent nail art challenge, participants were asked to create a nail design that complies with a Disney inspired theme. I only had The Little Mermaid in mind for the challenge. I can't imagine doing anything else. And so I created a Little Mermaid nail art design. This is by far, the hardest design I have painted on my nails. 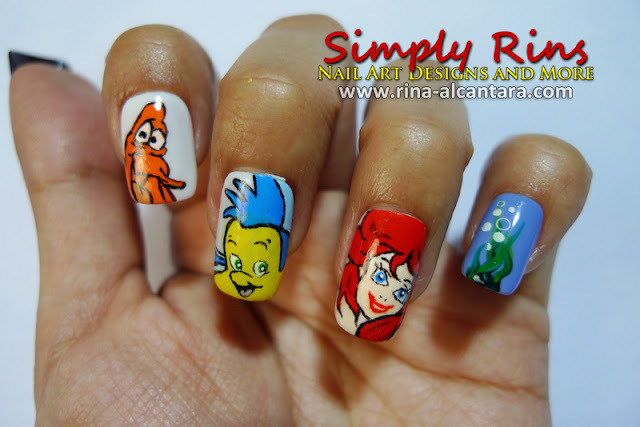 The Little Mermaid nail art design by Simply Rins. In the film, the little mermaid was named Ariel and she had a fish best friend called Flounder. She collects human things from sunken ships and goes to Scuttle, a seagull, to identify those she collected. In the movie, Ariel valued freedom and embraced curiosity above all else. This personality led her father, King Tritan, to assign a paranoid crab named Sebastian to look after Ariel. He was to make sure that our little mermaid stays under the sea and not follow her curiosity to explore the surface. But nothing could stop Ariel from surfacing that eventually led to love. Ariel fell for a human prince and she sacrificed her beautiful voice to the sea witch so that she could have legs and gain a chance to win the prince's love. In the end, their love conquered all. King Tritan gave her daughter legs and Ariel and her prince lived happily ever after. I was deliberating whether or not to paint Ariel's tail but decided to just paint her face. Accompanying Ariel on my nails are Flounder and Sebastian. I also wanted to paint Scuttle on my pinky finger. But I ran out of time and painted seaweeds instead. Base color is Essie Marshmallow in 2 coats. Everything else was painted using acrylic. Just to show you how much I love The Little Mermaid, I'd like to show you something that I nagged (yes, I did!) my mother to buy for me when I was still a teenager. VHS Tapes of The Little Mermaid and its sequel. VHS (Video Home System) tapes are now obsolete. It was one of the mediums to store films and was primarily used for home viewing. I asked my mother to get me a copy and when The Little Mermaid II: Return to the Sea was released, I asked her to get me that too! The sequel was not released on the big screen and this made me more anxious to have a copy. A closer look at VHS tapes. A Little Mermaid stress ball! I bought the stress ball for only Php20 ($0.45)! What a bargain, right? I don't really collect The Little Mermaid memorabilias, but I could not resist buying it for that price. The story of the Little Mermaid is more than just about love and self-sacrifice. Ariel showed us courage to follow her dreams regardless of what her environment tried to limit her. She went beyond what she knows and explored other possibilities. This perhaps is what charmed me to love this fairy tale. Like Ariel, I want to continuously challenge myself to explore life and seek opportunities that would contribute to my personal development. Disclosure: I submitted this Little Mermail nail art design to Orlica's Disney Nail Art Contest. The design was painted on artificial nails. WOW! You are truly amazing! Your hard work really showed! & I loved Cinderella as a child, but ever since I saw Tangled I'm loving that! i love the design :) we are going to use the litter mermaid song Under the Sea for our recital for Twinkle Toes does anyone know where we can buy a CD of the soundtrack? Coz i've been searching in SM malls it's already out of stock. I love the nails! I also have tapes of fairy tales at my mom's home! My favourite one was Sleeping Beauty! To cheri: Try going to Rustan's. Particularly, the children's section. They sell DVDs and CDs of movies appropriate for kids. You can probably find a soundtrack of The Little Mermaid there. Good luck! This is awesome! You have amazing design skills!